The 2015 Colm Quinn BMW Galway International Rally, running from February 6-8, looks set to be a cracker of an event, with top-class entries and a fantastic route in South Galway writes Yvonne Clinton. 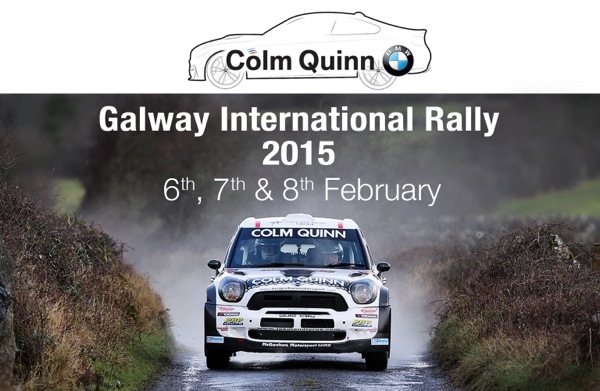 Colm Quinn BMW renewed their sponsorship of the Galway International Rally after the success of last year’s event. Speaking at the press launch, managing director Colm Quinn expressed his delight at being involved in the Galway International Rally for the fourth year running. After supporting the BMW Mini of Eugene Donnelly for two years he stepped up to the mantle of title sponsor in 2014. The fabulous state-of-the-art Colm Quinn BMW showrooms recently opened on the Tuam Road, and will play host to mechanical scrutiny of competing cars on the afternoon of Friday February 6, before the ceremonial start of the rally takes place in Eyre Square at 8pm. The following Saturday and Sunday will see a capacity entry tackle a 14 stage route in the South Galway area that has been devised by Clerk of the Course Kieran Donohue and his organising team. An experienced rally official, Headford native Donohue urges all rally followers to stay safe during the event, and to ‘keep the race in its place’. The cars return to service in Gort Mart several times over Saturday and Sunday, where they’ll be fettled or repaired, depending on the fortunes of competitors. On Sunday evening the rally will finish with a return to the Colm Quinn BMW premises, where the victors will be crowned and the champagne sprayed. With the event being the opening round of the Clonakilty Blackpudding Irish Tarmac Rally Championship, the entries are of a high quality. They include current champions Declan and Brian Boyle from Donegal in their Subaru WRC, looking to defend their hard-fought Galway win of 2014. After surviving the flood-hit stages of 2014, the Donegal cousins took a well-deserved victory just 25 seconds ahead of then-Irish Tarmac Champion Garry Jennings. Eugene Donnelly, in the Colm Quinn BMW backed Mini WRC, initially slotted in behind the battling Subarus. His rally would end in a disappointing fashion, when he put his car into a ditch on the infamous ‘Black Road’ test on Sunday morning. Despite Jennings’ best efforts, an off into a Galway stone wall would put pay to his chances of victory, and the Boyles claimed their first Galway win. With Jennings also entered again this year, the titanic battle is likely to be continued. They will be pushed all the way to the finish by fellow Donegal men Donagh Kelly and Kevin Flanagan in their Ford Focus WRC, and the UK’s Steve Simpson in another Subaru WRC. Last year’s Group N winner Josh Moffett makes the step up to WRC power in a Ford Fiesta alongside regular co-driver John Rowan, and his brother Sam is expected to join him in a similar machine. Sam’s Galway debut in the Fiesta WRC last year was mixed, with a fantastic fastest time on the opening stage tempered by his clipping a rear wheel and fluffing his launch control start on several stages, losing valuable seconds. If he competes between the Galway stone walls this year, he’ll be looking to improve on fourth from last year. With entries still flooding in ahead of the closing date, the event looks set to be hotly contested. NUI Galway graduate, 23 year old Dean Raftery, has recently been crowned the Irish Young Rally Driver of the Year. Raftery earned the award for his spectacular performance in the 2014 British Rally Championship. Competing in a Ford Fiesta R2, he sealed the BRC-2 support championship in an epic battle with Calvin Beattie during Manx Rally on the Isle of Man, an event he first attended as a baby in the arms of his father. Twenty-three-years later, the island would be a scene of jubilation for Raftery. Claiming championship victory by just five points, and third overall in the main British Rally Championship, the efforts of the trainee accountant with Deloitte were rapidly recognised by Motorsport Ireland. The award is accompanied by €50,000 of funding from the governing body, which will be of major assistance to Raftery in making decisions about his 2015 season. Several championship and car options are open to the talented driver, so his plans have yet to be confirmed. With sponsorship and support from Pirelli, in acknowledgement of his excellent results, he has his eyes set on rallying abroad. He intends to gain experience of competing on foreign events this year, before a major push to compete in the World Rally Championship in 2016. There, Raftery will have the opportunity to be noticed by major manufacturer teams and further his career. After being born into a Craughwell rallying family, Raftery initially starting in motorsport at the age of eight, taking up karting, which proved to be an excellent training ground for his driving skills. After a spell in Junior Rallycross, he turned his hand to rallying in 2011, finding himself adept at navigating the tricky Irish stages. He recognised the dream of many young rally drivers in November 2014, when he competed on Wales Rally GB, the closing round of the 2014 World Rally Championship (WRC). A fine finish of second in class on his WRC debut shows that Raftery has the pace to compete with the best young drivers in world this year. Facing into a year of new, unfamiliar events and exciting challenges, Raftery is hopeful of competing on the forthcoming Colm Quinn BMW Galway International Rally – provided there is no clash with an event abroad.